We had a really good time at the South West London Business Biscotti meeting April 10th . We celebrated its first year so now it's onwards and upwards to its second year of being ( hence the modified card see photo left). 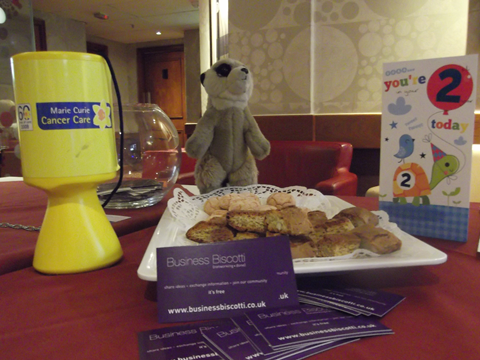 Not only were there Biscotti biscuits with the coffee and refreshments but a lovely slice of Birthday cake for members attending at the Gloucester Road Casino ! 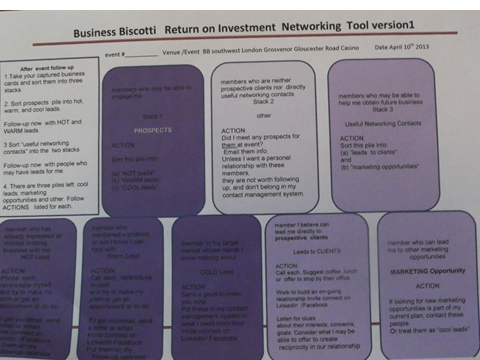 Talking with a number of fellow Biscottiers it was interesting to find out how they use such networking clubs to help develop their businesses. I'm sure you attend several networking events, the same as I do and find that you can spend a great deal of time with people who don't necessarily operate in the same business space that you do. The skill is to find the right events to attend; although this sounds obvious, it isn't easy there are no instant results. 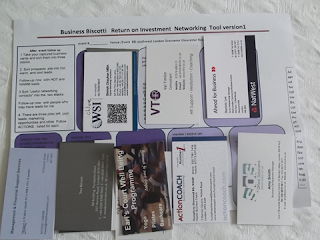 We meet several people and collect a lot of business cards. What is the best next step ? I have adapted and developed a system for following up which is comprehensive and you probably do some of it anyway. This is simply a structured way you might find works for you also. As with many business clubs you get out of it what you put into it. Some of the folk I met Business Biscotti were experienced net workers ( dare I say serial networkers) ,one or two were new to the whole process of networking and it got me to think about how fellow sales professionals follow up networking events but also with following up exhibition stand visitors and seminars etc. - so I share these with you. I have a adapted a process from the classic "Get Clients Now! "™ by C.J. Hayden but also updated with social media approaches etc focused more for the UK market. e.g. Prospects which you grade into hot, warm and cold leads. Another stack consists of cards with which you can see no direct link. The actions just prompts you by asking what can you do for them as a fellow net worker? Experienced and effective net workers will also act as active sites for others to connect as well. Hard sell pitching turns most people off at such events. Often the universality of the norm of reciprocity * (see below) repays your kindness and they help you connect with the people you would like to meet. And then a stack for directly useful contacts to be split between leads to clients and marketing opportunities. 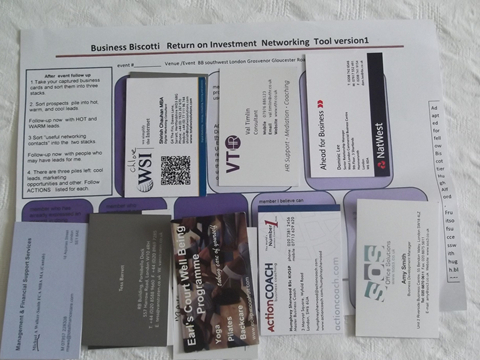 I have made an A4 landscape version of the flow chart which makes for a useful administration tool as the various boxes are about the same size as a business card. I am trialing a prototype with fellow biscottiers and getting their feedback for the final version.